Back in January, I wrote a National Review piece headlined, “Why You Should Ignore Every 2020 Poll.” Thus, what follows violates my own advice with the excuse that it is impossible to ignore the political equivalent of a train wreck. And that is how I characterize the latest rankings of the 2020 Democratic presidential nomination horse race. “Anyone can defeat Obama,” said Republicans in 2012, and in 2004 Democrats said, “Anyone can defeat George W. Bush.” Of course in both elections, voters were shocked and depressed when the incumbents were reelected. Furthermore, do not underestimate the power of incumbency. There is a historical reelection rate of 68.7 percent, including a winning streak of the last three presidents who at times were unpopular and controversial. With all that in mind, let’s circle back to the 2020 rankings. Topping the list is former vice president Joe Biden whose number one ranking in January was the impetus for me suggesting ignoring every 2020 poll. But, with the official start of the 2020 presidential election the day after November 6 midterms, perhaps Biden’s consistent number one spot should not be ignored or downplayed. Many Democrats (especially young Democrats) shake their head with a “no way” answer when Biden’s name is mentioned. Still, the Washington Post poll has a total of 72 percent of Democrats comprised of 46 percent who say that they will “certainly consider” voting for Biden, and 26 percent will “consider” voting for him. Biden’s encouraging numbers place him slightly ahead of Vermont Sen. Bernie Sanders with his combined “certainly consider” and “consider” voting score totaling 66 percent. Meanwhile, Sanders who turns 79 years old in 2020 is not even a Democrat — technically he is an Independent — but better known as a self-proclaimed Socialist. Whether or not Sanders’ 2016’s slogan, "Feel the Bern" will be revived for 2020 is anyone’s guess. But this we know, if Democrats nominate an aging Socialist with a platform of free health care and free college for all, the chances of a more moderate Democrat running as an Independent will help perpetuate the incumbent’s reelection streak. Third on the Washington Post ranking is Massachusetts Sen. Elizabeth Warren. Her “certainly consider” voting score is 28 percent and her “consider” voting score is 29 percent for a combined 57 percent. Perhaps it is just my Republican perspective, but when I think of Warren as the potential nominee, I am confident that she would follow in the grand tradition of the last two Massachusetts Democratic presidential nominees —John Kerry in 2004 and Michael Dukakis in 1988 — and go down in flames. Fourth on the list is Hillary Clinton. All I can say about that is “I’m with her.” Please, please, Hillary go for it, and this time you can win! What I find astounding about Democrats is they can’t move ahead, given that in these rankings 30 percent say that they would “certainly consider” voting for Clinton while 23 percent would “consider” it. Which leads me to ask, “Are 53 percent of Democrats who are open to voting for Clinton again stuck in a time warp or just brain-dead?" Finally, fifth on the list is California Sen. Kamala Harris, and her scores are intriguing. While Harris’ “certainly consider” score is 15 percent and her “consider” score is 27 percent for a respectable 42 percent total, her neutral score with voters is 40 percent. That means she has much room to grow. 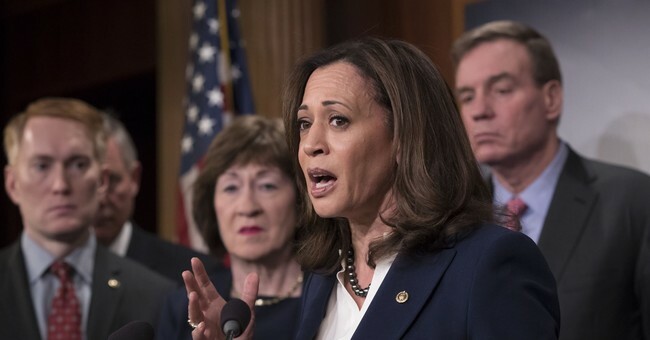 Full disclosure: I am on record predicting that Harris will win the 2020 nomination and firmly believe that at the very least, she will be on the ticket. As the Democratic Party candidate from “Central Casting,” Kamala Harris is the perfect opponent for Trump in 2020. When Morgan asked if there was an opponent who could beat him, Trump said, "I don't see anybody. I know them all, and I don't see anybody." On the contrary, even with this long lame list of Democrats, looking at the top five on the Washington Post’s ranking, I would recommend that Trump watch out for a Joe Biden one-term pledge with Kamala Harris as his VP. Second, be on guard for Terry McAuliffe. Even at 12th on the list, he is Clinton-lite, working behind the scenes in 2018, and the smoothest operator in the Democratic Party.